I have decided to publish here several articles opposing Bong Bong Marcos’s run for the Vice Presidency. I have, as you know, been opposed to Marcos for many decades now having seen, at first-hand, the devastating effect of his dictatorship on both private individuals and the country. It would be out of character for me to support a return of any Marcos to a position of power in the country, particularly one who steadfastly refuses to accept and apologize for the wealth-grabbing and the extra-judicial killings carried out by his father. This article was written by MARCK. That’s not a scarlet terno that Imee Marcos is wearing. Rather, it stands for the mountains where Macliing Dulag was killed. His blood ran down the slopes of the Cordillera in much the same way he wanted the Chico River to flow. To his dying breath—and years thereafter—Dulag fought against the hydroelectric power that threatened the survival of his people, in the hands of a dictator named Ferdinand Marcos. That’s not Imee Marcos gracefully crossing her well-formed, tanned legs. Emmanuel Lacaba’s legs were found in the same way, tied and chained, as his corpse was dragged to an unmarked grave. In 1976, Lacaba was captured with a pregnant 18-year-old comrade in the underground, and was shot with a .45 caliber bullet not once, but twice. His crime was to write literature in opposition to a dictator named Ferdinand Marcos. That’s not a tasteful bodice that highlights Imee Marcos’s ample curves. That bodice conceals how forces of the constabulary killed Edgar Jopson in 1982. He was found alive in Davao, but was still executed. It took nine bullets to murder Edjop: chest wounds, arm wounds, leg wounds. This son of a grocer became another statistic in a very long list of human rights abuses in the 70s and 80s, and personally earned the ire of a dictator named Ferdinand Marcos. Those are not the features of Imee Marcos, carefully airbrushed. Those were the walls put up along the routes whenever any foreign dignitary or visitor passed by to visit Malacañang Palace. Entire edifices were built around the Philippines to celebrate and commemorate the “New Society,” all the while those displaced are kept hidden from view. For one cannot be seen poor and starving when guests come by to entertain—and be entertained by—a dictator named Imelda Marcos. We’re not aristocrats or aficionados of high fashion: we’re not the intended audience of a magazine that represents the core of the upper crust. We have our broadsheets and our news sites, maybe the occasional glossy magazine in waiting areas: none of us have to read the Philippine Tatler. Maybe we’re overreacting, too: who’s to say that Imee Marcos isn’t a beautiful woman at the age of 60? To be fair, the Governor of Ilocos exudes more style at her age than quite a few women half her age. In recent memory, Imee has always represented that sort of fashionable élan with minimum effort, never mind airbrushing and cosmetic enhancements. Just a few days ago, Sen. Bongbong Marcos—who found the gall to run for the Vice Presidency just a few weeks ago—claimed that Filipinos are not concerned about the past, but are more concerned about their lives today. Never mind that we’re still paying off debts from the Marcos era, and vestiges of Marcosian kleptocracy are found in almost every public institution in the Philippines. The same can be said, I guess, for Imee Marcos: just because she’s a Marcos doesn’t mean she can’t indulge in the fantasy of being a “style icon” or whatever. At least to the Marcoses, what’s done is done. But is it? In any other sane situation, the Marcoses would be nowhere near magazine photo shoots or lecterns in Manila. The Marcoses would be languishing in prison, impoverished in much the same way they impoverished the Filipino people in decades of tyrannical rule. That period of conjugal dictatorship would have been an instructive case in how and why tyranny and oppression will never triumph. But every waking moment that the Marcoses are free to flaunt themselves in public is an excuse for amnesia: that it’s okay to cast them as oppressed heroes, that the “glory days under Marcos” become facts, and that they become free to be part of that very public institution that they corrupted for decades. We use the word “impunity” a lot these days as a catch-all term to the foibles and failings of government, but no political entity captures that more than the Marcoses. One cannot talk about impunity without talking about callousness: the kind of arrogance and swagger that comes with getting away with perpetrating injustices, human rights abuses, and institutionalizing cronyism and corruption in Philippine democratic institutions. And it’s this arrogance and swagger that keeps the Marcoses thriving in the Philippines. In any other situation, dictators are usually consigned to the dustbin of history. But not the Marcoses: without justice, Bongbong Marcos can still saunter up to a lectern in Intramuros and pretend to capture some semblance of eloquence from his father, calling for a “revolution” while blithely ignoring the fact that it was revolution that brought his family’s grasp on the country down. Without justice, Imee Marcos can pretend to have a “public service record,” and the “shadow of her parents” become footnotes to her being a generation’s “style icon.” Without justice, the Marcoses can sweep all their abuses and discretions under the rug, and woo the electorate with celebrities and a whitewashed, revised history. They want us to think that discipline is needed. They want us to think that life under Marcos was a “golden era.” They want us to think that rebuilding democratic institutions is useless unless we have strong leaders out front: preferably ones named Marcos. There is probably no democratic country out there that has given the same measure of forgiveness, leniency, and acceptance to a former oppressor than the Philippines. Perhaps it is because of our forgiving nature. Perhaps it’s in the way we are taught history: more of rote memory work than a careful analysis of facts. Perhaps it’s in our impatience—or inefficiency—at repairing and rebuilding our democratic institutions. Perhaps it’s in the penchant of politicians to cling on to any sort of political capital, no matter how ironic or hypocritical it is (like Bongbong Marcos advocating for the SAF 44 or Imee Marcos advocating for the arts). Or maybe it’s because for the lot of those who admire Marcos, we prefer the in-your-face kleptocracy than ones disguised as democratic projects. And maybe—just maybe—there are idiots in our midst, in the same way we have dictators running the show from somewhere. The road to 2016 saddles us with tasks more important than just voting: we have the task of ensuring that history advances. We have the task of seeing beyond the glitz and the glamor of images, and seeing to it that history—for all its faults and successes—does not repeat itself. History shows us that there is just no way that Imee Marcos should be seen as a “style icon,” but as the scion of a dictator complicit to the abuses of power. History shows us that there is no way that Bongbong Marcos can bring back the “glory days” under his father, when we all know that the only glory found there was in the Marcos bank accounts and the gun-barrels of government assassins. No thing—not from the ruling class, not from Marcos supporters, not from those harebrained enough to support Martial Law on Twitter as if no politically-motivated death happened under Martial Law—should ever get in the way of us understanding why we should reject the Marcoses, and purge them from our political life. Because that isn’t Imee Marcos sitting on that cover, with her bare feet dangling elegantly by the folds of her scandalously-long terno. Those are the very bare feet of the millions of Filipinos who suffered from famine in Negros and other parts of the Philippines. Under the “glory days” of Marcos, they starved, subsisting on “fortified” grain, and walked barefoot on ground parched and left fallow. All this happened while Imelda was entertaining concert pianists and Hollywood actresses in Malacañang, while Ferdinand was wheelin’ and dealin’ with the cronies that made up the government. All this happened while Imelda started collecting thousands of shoes, and built her socialite dreams on the backs of the barefoot children of famine, who walked the dry ground to bury the baby that died. That infant—like Apo Macliing, Edjop, Eman Lacaba, Liliosa Hilao, Lorena Barros, Juan Escandor, and so many others—all left a crimson stain in the ground, in a hue no different from the cloth of Imee Marcos’ gown. Thank-you Caroline I have not spent very much time in the Philippines, only 3 months. But after traveling in Luzon last year I could not help but wonder how much further ahead the country would of been if Marco’s had not been in power. They had everything that they needed to make The Philippines a first world country. Take the road system for example. Thank you, Virginia. I hope you will go back and see the rest of the beautiful country. Thank you for your blog. I have learned so many important details about the kleptopcracy of the Martial Law era which is quite an enlightenment. I was born and raised on a small island in Leyte (Imelda’s home province). I grew up in dire poverty with no electricity until I was 13 years old (1985). I have never seen a library until I was 12 when my parents decided to send me to the city (2 hours away from our village) to attend high school. Imelda had all the resources to alleviate poverty and yet she chose to spend the resources on enriching herself and her cohorts. She NEVER did anything substantial to help even the people in her very own home town. All she did were cosmetic projects that didn’t really improve the subsistence of the poor constituents. The price of one of her diamonds would have been more than enough to build libraries for every single village on the island, install electricity and improve the roads. She is a disgrace to the country and her lies and fantasies were an injustice to every single hardworking Filipino. Caroline, THANK YOU for bringing the “skeletons” out in the light. I can’t thank you enough. And to MARCK who wrote The Crimson Stain, your article is so powerful that it made my hair stand on end. You’re very welcome. You sound like you were able to be educated to a high standard despite your the “dire poverty” of your background. Congratulations. The Philippines needs people like you. The wounds of the past are still fresh – like a cancer, they awaken the sore spots even b a gentle touch. Thank you for sharing. I was a product of that era; indeed it was a golden age for our culture but greed and power overtook all the good intentions. The Philippines benefited from all the development done at the time. But, at the same time we were doomed to suffer into the future because of selfish motivations. Yes, no more Marcos in Malacanang. But why do people still put them in the position of power? I cannot comprehend that. Yes, Luau, we both were around at that time and saw the suffering. I knew Eman Lacaba very well. He was a great poet and the Philippines would have been proud of him if he hadn’t been butchered by Marcos. Admission and saying sorry for the wrongs done is a sign of humility. This is the right way for forgiveness and genuine reconciliation. Hi Pete, good to hear from you. I did indeed see the parody. Great stuff! Do keep in touch. Hope to see you next time I am in Manila, mid March, when Jasmine is expecting her baby. Thank you for for this blog,i hope the uneducated generation would read and comprehend what happened during martial law.More power to you,Mabuhay! Thank you, Cedric, for your kind words. yes..filipinos are not only forgiving in nature but,also genius in seeking the truth,learned easily,discover deeply the true history..that is why filipinos now awaken..compairing the past and the present that enable some to ponder..we should go back to Marcos dreams for the Nation to start.. It was a well written up for you to amuse others. What authority of sort do you have when you don’t even leave into our dear country. Let us decide among ourselves and don’t push your wishful thought to us. We are not what you think as black yes and brown skin people without the brain to think for our own good. Please leave us alone if you cannot come and live with us here in the Philippines for good. If Only those who rule after the Marcoses honestly pursue justice for those poor victims and not look the other way and start enriching themselves. This history will have a justified ending. If “Padrino” system is not higher than Law and Justice in our country, then government helpful hand can reach the poor. Thanks for this Blog. Wake up Filipinos. So very well written. I was a part of that era. I knew many people/classmates who were tortured because they expressed how they felt aboutthe “golden age”. In a way it was golden age but only the Marcos clan, with all the gold and blings of the dictators. Poor Philippines and it’s people because all the presidents after Marcos learned how to be selfish n steal robbing the people of their rights. Yes, sadly you are right, Josephine. The Marcoses set an example of how much the First Family, their friends and cronies can make and others after them have followed suit. But I believe none as greedy as Ferdie, Imelda and their family and friends. anywhereiwander, you ought to publish more such pieces in the drive to condemn the brutal abuses of the Marcoses. The younger generations who need to be informed to truly avoid that era happen again – ever. While many if not most of us agree that the Marcoses left the country in tatters and should not be returned to elected posts, most politicians like these unremorseful Marcoses I find them less to blame rather, the stupid voters who keep recycling the same rotten eggs. The challenge should be a nationwide educational campaign on the bad consequences of the voters’ shallow if not selfish motives for so long. And it is in the youth that we may have the chance because their elders (those over 50) are still stuck with the old dirty politics. You are correct Bing De La Vega! If only some of our kabayans realize the intensity of them recycling those rotten politicians over and over each voting time, Philippines will remain in its stance these days and the coming years. No hope! Same with those idolizing the Marcoses. The irony is, they keep closing their mental awareness of the implications that this family brought to the Philippines. Thanks to this article which was kindly shared by my friends son, Cedric dela Cruz. I hope every kabayan who happens to read this article would be enlightened about their perception on how bad the influence the Marcoses brought to our beautiful country. Only ignorant people votes/will vote for the Marcose’s, those who have sold their souls, their children’s soul, grandchildrens, great grandchildrens and all of their future descendants soul to hell. Thank you Ms. Kennedy for sharing this. Passing forward. Thanks. Using Imee Marcos’ photo as an image of what happened leaves a “clearer” picture of the events that took place. Its people like you that make people dwell in the past. Bad things have happened, are happening and will happen, it is unfair to judge the son by the father. Why not write about Cry’s corruption that we still feel now, like the sale of Meralco. People like you are blinded and are really stupid. I have no more words for people like you. we got hurt, we move on but how will we move on if you continue to dwell on the past. Deal with past events and build a brighter tomorrow. I hope you clear your mind for our country’s sake. You have every right to believe what you want to believe. But you do not have the right on this site to call me, or those who agree with my point of view, “stupid”. I leave it to the readers and commentators to decide who they think has the stronger argument. Raffy Pulido, how old are you? Where were you during Martial Law era? Before calling somebody who tries to lift up the dignity and spirit of the Filipino people ‘stupid’ take a little time to ask those who have been there. Go to the National Library and read newspapers during the 70’s and 80’s. By doing this, you might be awakened and apologize to the lady. Your facts about Meralco are misinformed, I’m afraid. But if that is what you want to believe then it is your right to do so. Is Bongbong running because he is a Bongbong? No, he is running because he is a Marcos. He is running because his father, the dictator, has spread too many lies and deceit that he created minions of stupid individuals who want us to simply forget what they have done in the past not to create a brighter future, but to sweep their crimes under the rug. if your entire family was killed by a group of thugs, and this group suddenly tells you past is past and let us just move on and not dwell on the past, would you do so? Or would you want justice to be served? Bongbong is running because his past allows him to do so. It is he who keeps on narrating all the good things his father has done and would like to make stupid Filipinos think that since his father is good, then he is also good. But when people remind him how bad his father was, he suddenly says let’s focus on the future and not dwell on the past. When history supports him, he remembers, but if it belies him, he forgets. Is this selective memory or calculated lie? You tell me. So the sins attributed to the father can be passed on to the son….. yeah right. So only the good deeds of the father can be attributed to the son? I don’t think so. And on the good deeds, if I slap you in the face then give you a piece of M&M, then slap you again and give you another piece, and we play this game the whole night. In the morning, will you count the number of M&Ms you got and brag to the world how good I am for giving you M&Ms, or will you count the slaps you got and tell the world how bad I was? Marcos did some great things, roads, bridges, buildings, lots of M&Ms, but behind each piece of M&M, he stole millions of pesos through corruption and unscrupulous deals, and it dragged the entire economy down, from 3 pesos to the dollar when he started, to heaven knows how much to the dollar when he left in 1986. You guys only want to count the bridges but not the corruption, massacres, abductions and death. So for all those who want us to simply forget what the Marcoses have done, I have a gift for you. I will give you buckets of M&Ms, one by one all through the night. And in the morning, let us count. @Daniel C. Almirez: it is not the sins of the Father that is being passed to the Son. It is the attitude of the Son regarding his father’s sins…like FEM did not do anything wrong. I don’t think one has to be a rocket scientist to conclude that Marcos enriched his family while he was in office. Can anyone become super rich from the salary of the President of the Philippines? 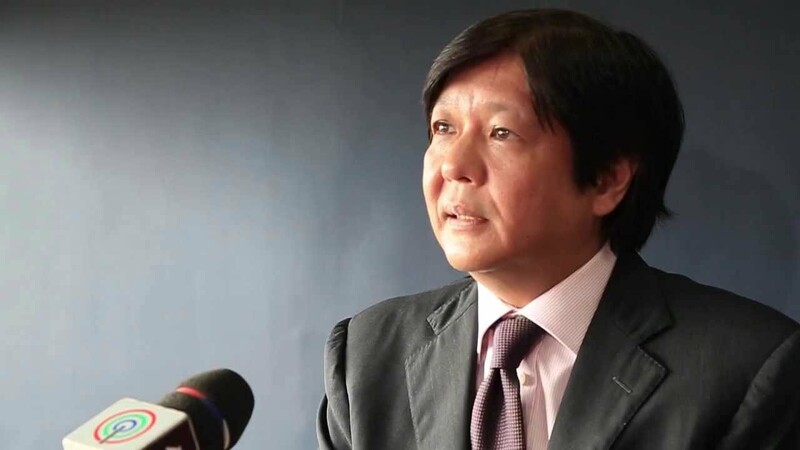 Bongbong is trying to hoodwink Filipinos that the Marcos regime was the Philippines’ golden era. If it were so, why did people oust him through a People Power Revolution? If he did things for the country rather than for himself and his cronies, people would love him…but they revolted. Revolution happens because something is wrong..and this is what the Marcoses will not admit, nor apologize for. Are the Filipino people so dumb? Unfortunately, many are still willing to sell their votes. Until the people of the land learn to discipline themselves crooked politicians will prevail. The destiny of a country, although guided by leadership, is dependent on the attitude of the citizenry. When will Filipinos learn and be politically mature? You are right, Ding. By not accepting the failures of his father, Bong Bong is admitting it is fine for politicians to milk the country dry, to incarcerate their enemies and to destroy democracy. What do you think is happening today in the Philippines? Worst than Martial Law…Only very few rich individuals, corporations, banks, and politicians are getting in a very good financial shapes. Do you think many OFWs still got no choice not to believe your democracy while their sufferings of insults from their own government by sending them like they’ve no choice but to believe that the Philippines cannot afford their salary requirements because the government has no control of the market system…that’s bullsh?t, right! Democracy is full of propaganda! During the Marcos era, this Bullsh?ts don’t exist! This democratic government is lie ten times more than telling the truth! Tagayana, I don’t think you read the article we are talking about here. The article talks about the Marcoses, and the widespread killings, tortures, corruption and intimidation during their reign. It is not comparing the current from the past, it is simply reminding us of the past. And simply saying that the current is worse based on your sweeping statements does not make the past any better. If I slap you in the face so hard that it makes you want to cry, then point a loaded gun at your face and tell you not to cry or even utter a word or I shall end your life, and you keep your mouth shut for sheer fear of your life, and nobody hears you cry, does that make it ok and does that paint a peaceful and democratic world? Now when someone slaps you again, probably it brings such a delight for people to slap your face, but this time that someone allows you to cry, and so you cry like hell, and everyone hears you cry, does that make the second slap worse? And if I tell you that my slap was better because you didn’t cry while the second was worse because you did cry, in fact everyone heard you cry, does that make me a better person? Does that make me your friend? Does that make me your hero, that if I pass away, you will bury my body at the libingan ng mga bayani? Does it? Before you answer that, let me get my iron gloves ready and a samurai because I don’t have a loaded gun, so I am prepared for your reply. Caroline, please keep them coming, perhaps it will make some amnesiac Filipinos to recall!!! Ms. Caroline, thank you for your article. First of all, I’m not a fan of the Marcoses. However, I have noticed that all write-ups on the Marcoses are all negative. My question to you is if a relative of yours raped someone are you at fault because you are a relative? If your answer is yes then it justified the accusation to Marcos with what the Military wrong doings. If your answer is no, so how can Marcos be at fault with some Military wrong doings? Let me ask you how you would say with the Farmers killed at Mendiola during Cory Aquino, the families never got justice and this incident but it never been re-written. Is it because people who were whitewash by propaganda thought its okey with Cory Aquino to get away with it? How about the SAF 44, Nonoy Aquino was nearby but done nothing to speed up the re-enforcement because the BBL is far more important than the life of the SAF 44. As you have said it, many roads, bridges, and buildings were erected but only as a facade. They were all erected as monuments to foreign debts heedlessly incurred by the Marcoses. Do you see roads, bridges, and buildings were erected by the succeeding Presidents after him and our foreign debts had double or tripled?